The National Voice for Kids, Creative Kids. Waco, TX: Prufrock Press, Summer 2010. Print. 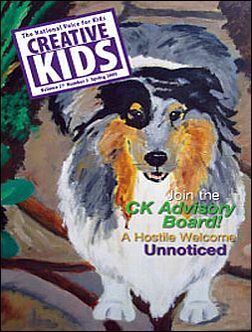 The National Voice for Kids, Creative Kids. Waco, TX: Prufrock Press, Spring 2010. Print. Most tween magazines have sections for reader questions and submissions, but Creative Kids takes that idea to whole new level. The entire magazine is made up of submissions from tween readers. Most submissions take the form of short, auto-biographical stories, but there is also poetry, puzzles, artwork, craft how-tos, book reviews, and short fiction stories as well. Even the occasional author interview is submitted by readers. The main attraction of the magazine is, of course, the fact that it is written by kids, which means it speaks to kids in their own words and tells them that their voices have value. Unfortunately, that also means that each issue is lacking in cohesiveness. It is a fairly serious looking magazine, considering it's target audience; the pages are newsprint, not glossy, and while no story is very long, it's missing the one liners and paragraph blurbs that help make other magazine's pop. Overall though, this is a good magazine to have around for tweens and is full of interesting and relevant stories and articles. The magazine says that it is meant for kids aged 8 to 14, but the submissions are mainly from kids aged 11-15. Creative Kids is not likely to catch they eye of many reluctant readers, it's main appeal will be to aspiring writers, especially girls. However, the length and subject of the short stories, and the periodical format, makes it a decent bridge to try to get some of the kids that have begun reading some of the flashier and non-fiction periodicals regularly, but still find full length fiction novels daunting.